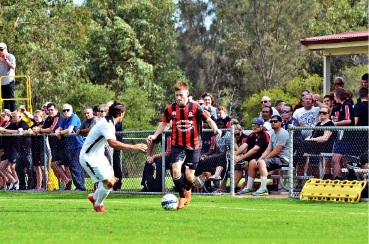 Armadale and Perth Glory played out a 1-1 draw. Both sides were unable to finish in the first half, with a goal coming from Glory’s Morgan in the 61st minute and Armadale’s Sardelic in the 89th. Armadale coach Paul Price said both of the goalkeepers were in great form. “You could criticise the finishing, but both goalkeepers were excellent today,” he said. The ball was at both ends, with the first shot coming from Armadale’s Caleb Dixon, who forced goalkeeper Jordan Thurtell to make a save, which stalled the ball long enough for the Glory defence to make a headed goal-line clearance. Controversy arose in 29th minute as Armadale’s Alex Salmon went down inside the box and their penalty claims were waved away by referee Michal Jasinski. Just before the break, Perth Glory’s Jacob Mustafa had a great one-on-one opportunity, with goalkeeper Alfie Brincat slipping over, but the shot was fired straight at Brincat, who made the save. It took the Glory just 16 minutes into the second half to score, as Morgan found a gap in the middle of the Armadale defence, giving him enough room to edge it past Brincat. For the third time this season the Glory conceded another late goal, this time in the 88th minute, as Sardelic drove down the left wing, moved into the box and fired it low into the back of the net. The 2015 Armadale young player of the year said the goal was a result of good team work.